In these unusual times, measures of inflation make monetary policy a fraught issue. The monetary policy agreement between the ministry of finance and the RBI, as well as the Urjit Patel report, has argued, not inappropriately, that the inflation target/ objective should be based on the CPI. In normal times, that would be completely unobjectionable. Leave aside the politics and media attention surrounding monetary policy and focus on the analytics. These appear to be unusual times to be navigating monetary policy. But nearly all serious commentary, especially from the financial community, seems oblivious to two facts about the current conjuncture. First, there has been a quantitatively unprecedented divergence between the different indicators of prices. The chart illustrates this. It plots the real policy rate (that is, repo rate) — the difference between nominal rates and inflation, and a good measure of the monetary policy stance — based on three measures of inflation: one, the CPI (which captures consumer price inflation); two, the GDP deflator; and three, the average of the inflation of the CPI and wholesale price index (WPI), which is a proxy for the GDP deflator. There are two reasons to favour the average of CPI and WPI inflation to the GDP deflator: Uncertainty in the national income accounts afflicts the GDP deflator, and the GDP deflator is only available quarterly and is hence unavailable for the latest time period. A monthly version of this chart accompanies the article. Second, there is the fact that India’s corporate sector is unusually stressed, with debt-equity levels rising and among the highest in the emerging market world. The counterpart, of course, is the unusually high level of stressed assets in the banking system, especially among public-sector banks. Today, real policy rates are either 2.4 per cent, based on the CPI, 5.9 per cent, based on the average of the CPI and WPI, or a whopping 7.5 per cent, based on the GDP deflator. 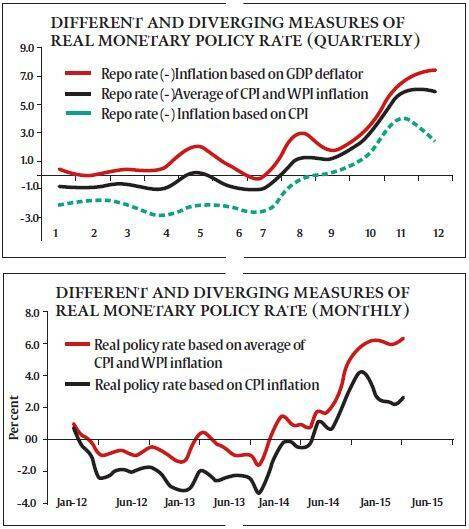 Which is the right measure of the monetary policy stance? As the chart illustrates, this question has become meaningful of late, due to the divergence between the headline measures of inflation that has not been present since Q1 2013. The monetary policy agreement between the ministry of finance and the RBI, as well as the Urjit Patel report, has argued, not inappropriately, that the inflation target/ objective should be based on the CPI. In normal times, that would be completely unobjectionable. But are these normal times, when the price indicators are, frankly, pointing in dramatically different directions? Step back and ask what monetary policy is about and how it works. The objective of monetary policy is ultimately to create confidence in the economy by maintaining a stable price environment for all agents — consumers, producers, savers and investors. Stability allows all agents to make sound economic choices. If the stable macroeconomic environment is meant for all agents, it seems that the relevant policy rates could be based on any and all of the price indicators: Households make financial choices about allocating their savings across different assets depending on the CPI-based real interest rate; producers make investment decisions depending on the GDP-deflator-based real rate; and some combination of prices determine choices about consumption of durables and housing. One way of understanding the complications is to see how monetary policy transmission works. Suppose that inflation is too high and the RBI wants to reduce it. The natural response would be to increase the policy rate. This would be effective in two ways: on the deposit side of banking balance sheets, deposits would increase as consumers/ households now find savings more attractive. In making this calculation, households look at the real interest rate to decide on their allocation of financial savings. This increase in the demand for money as financial savings, and a corresponding reduction in the demand for goods and other assets, leads to lower inflation. On the asset side of bank balance sheets, raising policy rates works to reduce consumption and investment demand by raising the cost of capital. Now, what is the real cost of capital for producers? That cost has to be measured in the units that are relevant to producers — that is, in terms of the goods they sell — which is proxied by the GDP deflator. In other words, for monetary transmission to work, both consumer prices and producer prices are relevant, but for different sets of agents. Enter the second factor, stressed balance sheets. Now, from a firm’s perspective, real interest rates of between 7-7.5 per cent are high in normal times, but even more so when balance sheets are stressed, as high rates imply greater debt rollover costs. Recall that Japan was unable to solve this problem for a long period. The reasons were several but it could not do so, despite very low interest rates. Resolving the stressed balance sheet problem — which is currently a serious impediment to the revival of private investment — at high real interest rates becomes even more difficult. So, is the current policy stance appropriate? Of course, that is difficult to say but at the very least, there needs to be more analytical discussion. In particular, there needs to be greater recognition that these are unusual times; that real policy rates have diverged significantly for consumers and producers, and are unusually high for the latter; and that for producers, high real rates must also be seen against their balance sheet problems.